Louis Kincaid is desperate to wear a badge again. He's cleaning up his credit and getting in shape. But there's one big obstacle in his way—his old nemesis Sheriff Lance Mobley. He's willing to give Louis a shot but only if he proves himself on one of the weirdest cases Louis has ever worked. 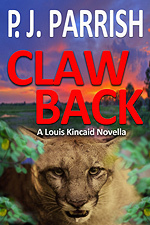 If he can find a missing eight-year-old in the steamy Everglades maybe he can claw his way back to his dream and his identity as a man.